My name is Fonzie, I am a handsome boy, very friendly, looking for my furever home. I have a lot of energy to spare but I am also very quiet and well mannered at home. I have never destroyed, chew or had any accident at home. I always share with my foster mom when I need to go out to do my doo-doo and when she is working from home, I just quietly take a nap. I am at the happiest when I am able to play in the backyard with another dog and typical from my boxer genetics, I tend to come up a bit strong and not to know when to stop so I need to keep learning my boundaries. I will do best with another female dog! But I also need to spend time with my person and need very much a balance between playing and having a long nice walk around the neighborhood or going hiking. Since I moved in Toronto, I made a tremendous progress to walk on a leash. I now stay quietly next to the heel of my foster mom, I can still react once in a while when seeing other dogs but I made lots of progress and my reactions are very short. This is because I am always down for a good play time! I know how to sit, lay down and I am good with recall. I will need to continue my training when being off-leash in a non-fenced yard, especially if other stranger dogs are around! My foster mom lives in a condo downtown Toronto, I demonstrated that I was not doing well when being left alone there. I was getting very anxious because of the stimuli created by the noise of the neighbors, the elevators, the back and forth in & out. So my foster mom and I moved to the countryside in the mom’s house of my friend, Jade who is an alumni of Redemption Paws. And what a change for me was that !! I am so happy to play with Jade, to have a backyard to run, stretch and take a sunbath, I am much more relax and independent inside the home and, the best is that when I am left alone there my anxiety is lower ! I am waiting in the crate for my foster mom to come back. Even if I look like a tough guy, I have a sensitive soul and no vice in me. I love to cuddle with my foster mom on her laps so I am hoping you enjoy hug time too. Oh and my specific characteristic is that I wiggle right left for a while and jump very high when my foster mom is coming home because I am so happy!! 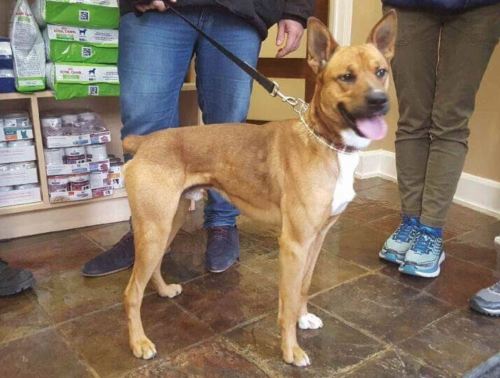 Are you looking for a friendly dog who loves life? Are you active and do you work an easy schedule? PERFECT! Apply to adopt Fonzie today.